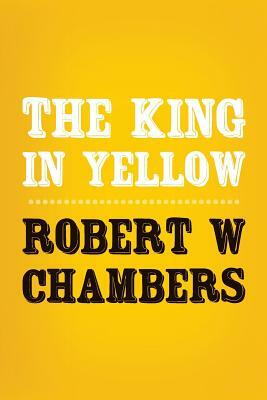 The King in Yellow, a book of short stories by American writer Robert W. Chambers. The book is named after a fictional play with the same title which recurs as a motif through some of the stories. The first half of the book features highly esteemed weird stories, and the book is described by S.T. Joshias a classic in the field of the supernatural. There are ten stories, the first four of which mention The King in Yellow, a forbidden play which induces despair or madness in those who read it. The first four stories are macabre in tone, centering, in keeping with the other tales, on characters that are often artists or decadents. The first and fourth stories are set in an imagined future 1920s America, whereas the second and third stories are set in Paris. These stories are haunted by the theme: "Have you found the Yellow Sign?" The weird and macabre character gradually fades away during the remaining stories, and the last three are written in the romantic fiction style common to Chambers' later work. They are all linked to the preceding stories by their Parisian setting and artistic protagonists.